The Marvis Cinnamon Mint Toothpaste comes in a triple pack, making it a great bargain buy. This toothpaste is refreshing but has the warming sensation of cinnamon and all the benefits that this spice has to offer. This cinnamon mint toothpaste can help with a number of worries when it comes to the care of your teeth, including tooth decay, tartar and plaque. 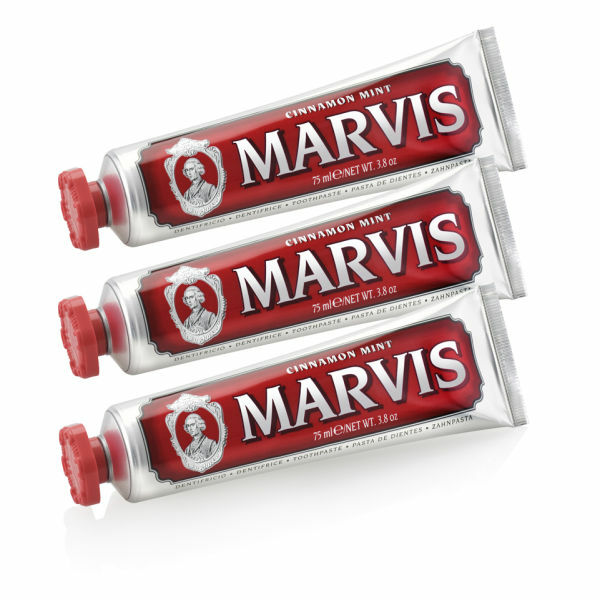 The elegance of the vintage-style packaging is a refreshing change from the more clinical packaging that other brands use, and a Marvis toothpaste tube would look great in your bathroom. Toothpaste is very easy to use, repair anti-allergy. Decent quality, nice combination of warm and cool/clean sensation, very well balanced aroma. im a coffee drinker and I find this good. Better than the whitening paste. Should give a try.